Delivering proper care to oily and dehydrated face skin is truly challenging. In most cases such skin features imperfections in the form of blackheads, acne, uncontrolled sebum production and accelerated keratosis. If you face the very problems, find out, which mistakes shouldn’t be made any longer to enjoy beautiful and healthy skin in the near future. Why Skin Condition Gets Worse? There are plenty of factors that can lead to skin condition deterioration, to its dehydration and appearance of blackheads or excessive sebum production. The factors can be divided into two categories: internal (that we can’t control) and external (which we have bigger or smaller influence on). To the first group we can include: fluctuations of hormones levels, diseases and genetic predispositions. The other group includes: our beauty routine, application of mismatching cosmetics and lack of proper hygiene of the things that we are surrounded with. Products featuring detergents in their composition seriously disturb the natural hydro-lipid barrier and wash away lipids from skin surface. Moreover, the use of such products causes dehydration as well as the sensation of constantly dry and thigh skin. Also, they can lead to irritations, intensified seborrhoea and inflaming the acne. Constantly working air-conditioning significantly decreases the humidity level of air which causes skin dehydration. How to deal with this problem? Definitely, you shouldn’t go for strongly oiling products because they can encourage acne and clog skin pores. A better solution is application of herbal waters, mists and moisturising creams a few times a day. Another beneficial solution is drinking 1 litter of fresh water daily. Creams based on paraffin, lanoline and other similar substances creating a thick layer on skin don’t serve oily and dehydrated complexion well. Occlusion can contribute to clogging skin pores, encouraging uncontrolled skin shinning especially in T-zone as well as appearance of acne and blackheads. Furthermore, due to using such products we disturb the natural hydrolipid barrier of skin and contribute to inflammations. The oiling and water-replenishing features of light-formula creams aren’t strong enough. Therefore, while choosing a cosmetic to treat oily and dehydrated skin with, you have to analyse its composition first. In short, it should contain ceramides, cholesterol and unsaturated fatty acids owing to which the intercellular cement of skin can be reinforced to create a barrier preventing water loss. The formula itself is also important, It has to leave skin neither tight nor too greasy. Regular exfoliation of dead epidermis cells of skin regulates work of sebaceous glands and unclogs skin pores. Essential though is to apply peelings that are either enzymatic or feature fruit acids. It’s also worth realizing that peelings featuring abrasive particles (no matter their size) might cause irritations and intensify the problem of inflammations. Actually, the most beneficial outcomes of peeling use is when it’s reapplied every week, or twice a week. What’s extremely crucial, after exposing face skin to the work of exfoliating agents, it must be wiped with a toner immediately afterwards so as to restore the right pH level. For this procedure you can go either for a toner or a herbal water. Both products are characterized by slightly acidic reaction. Too intensive oily and dry skin washing can dehydrate it even more; also, this can disturb the work of sebaceous glands. Dehydrated skin will start to defend itself so sebaceous glands will began to produce more sebum then they do normally. 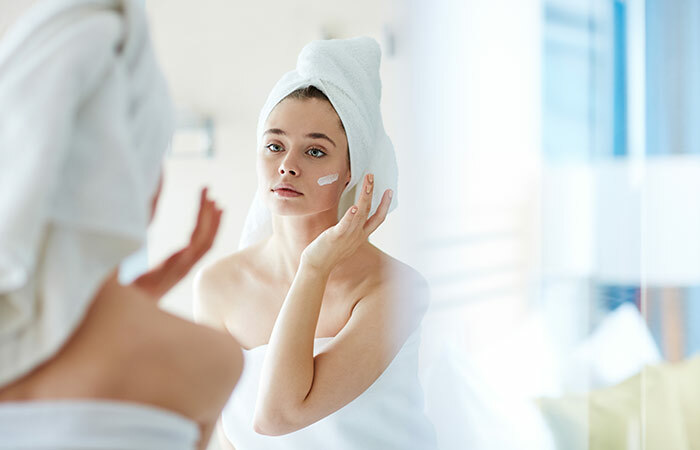 As a consequence, you will spot new blackheads and acne accompanied with a huge amount of sebum that you will probably try to remove again using cosmetics featuring detergents. And this is exactly how the vicious circle of oily and dehydrated skin care looks like. Matching cosmetics to the prevailing season is considered as crucial in terms of proper oily and dehydrated skin care. In short, during winter the skin has to be treated with thick creams, whereas in the summer it should be exposed to light-consistency creams featuring UV filters. Why is that? In winter skin dehydration is deeper and seborrhoea is less intensive. On the other hand, during summer skin works the opposite: moisturisation is better, whereas sebum production is intensified. The special attention must be paid to the action delivered by clay masks. If you let them sit on your face for longer than 10 minutes then they will leave your face dehydrated and cause this weird tight skin sensation. Therefore, it’s crucial to spray clay mask with a herbal water once in a while. However, when it comes to dehydrated and oily skin care, these are gel masks that serves best. They don’t clog skin pores nor leave it dehydrated. In fact they work the other way round because they replenish skin with water and reinforce the natural hydro-lipid barrier of skin. Next » Plants from meadow and garden that will pamper your skin « Previous Bio-Oil Dry Skin Gel. Will it replace popular Bio Oil Specialist Skincare Oil?